My best advice to anyone dealing with cancer: Get to know your doctors. I threatened mine. He warned me about my vocal cords. Said he has to cut into them sometimes when he removes the thyroid. “Your voice could sound like this… “ He made a raspy sound. Papillary carcinoma—gone. Found by mistake, during my second Pet/CT scan to monitor the effect of chemotherapy on the breast cancer. The creepy crud had moved from my breast outward, to my sternum and my lymph nodes, but the cancer in my breast had nothing to do with the thyroid cancer that showed up a year later. My breast surgeon started me on the path to make sure your doctor cares even if he thinks you’re crazy. She and I got along really well. I told her about my vision, all my parts intact. I knew my breast would remain on my body—first a dream, then a real strong intuition when I showered that morning. I wanted all the doctors to cut as little as possible, don’t stir things up—allow my body time to heal. Don’t entice those ugly cancer cells to run amuck. But never did I go against my medical team. I made informed decisions and pushed back when the doctors wanted to go too far. We knew the cancer went into my lymph nodes because they did a biopsy, a deep, painful one. We knew my sternum lit up like a Christmas tree on the PET/CT scan, but the first doctor wanted to do another biopsy, this one on my bone. “Why? Is the treatment the same?” I said. I refused to let them cut into my bone to find out what they already knew and what took them three weeks to discover—the cancer had spread. Most people catch breast cancer long before it progresses. Not me. Stage IV is the place I began my battle. A cancer diagnosis of any kind is difficult. I’ve lost friends and family to the disease. I’ve seen patients not ask questions, blindly follow doctors’ orders, and not share everything with their medical team. Some of them are gone now. How did I get to be the chosen one? 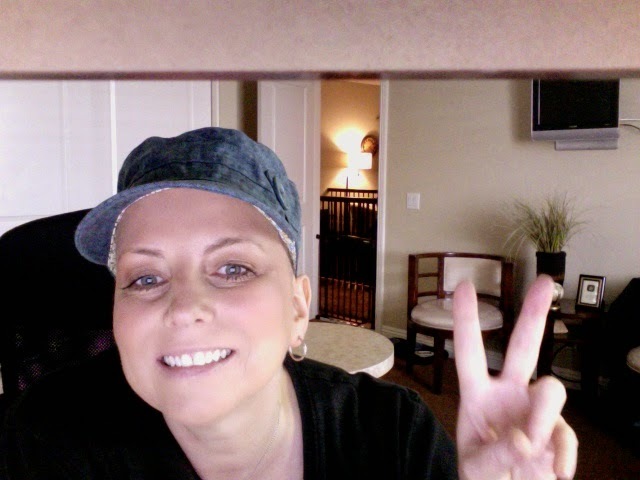 In remission from stage IV cancer, feeling better than ever. I resisted the temptation to look away and let the doctors do what they wanted—difficult because it felt like confronting death. I questioned and re-questioned. I understood what I needed and pushed back at times—active every step of the way, either through my family or on my own. Six rounds of aggressive chemotherapy, surgery, two years of Herceptin infusions, a month of daily radiation, active involvement in my treatment . . . and my entire life rebuilt because it went to crap during my victory. That’s how I beat stage IV cancer. Not easy, but darn, I think I’m pretty lucky. Now I’m working on turning my journal into a book, RUN—expected release date, early 2015. Roni Teson is the author of Twist, March 2014, and Heaven or Hell, August 2012. RUN, her book about the cancer battle will be released in 2015. Thank you for your note and kind words! HOW I GOT CURED FROM HERPES VIRUS HELLO AM PAUL JONHSON I'm from USA , I have been suffering from HERPES virus for the past 3 years and i had constant pain especially in my knees, During the first year I had faith in God that i will be healed someday, but this disease started circulate all over my body and i have been taking treatment from my doctor, few weeks ago i came in search on the internet if i could get any information concerning the prevention of this disease, on my search i saw a testimony of so many people who has been healed from Hepatitis B, HIV/AID, MRSA Diabetes,HSV, ALS HPV and Cancer by this Man called Dr.ALUYA and he also gave the email address of this man and advice we should contact him for any sickness that he would be of help, so i wrote to Dr.ALUYA telling him about my HERPES Virus he told me not to worry that i will be cured from this deadly disease i never believed it, well after all the procedures and remedy given to me by this man, few weeks later i started experiencing changes all over me as the Doctor assured me that i will be cured,after some time i went to my medical doctor to confirmed if i have be finally cured behold it was true,and now i'm cure totally with Dr.ALUYA medication, So friends my advise is if you have such sickness or any other at all you can email Dr.ALUYA on this email; DR.ALUYASOLUTIONTEMPLE2@GMAIL.COM or add him up on what-app +2349073364485 for HELP. he will help you also.